Last Saturday I attended The Red Hat Society Tea at Grace-Marie’s Kitchen at Bristol Farms in Manhattan Beach. I was very excited to meet the Red Hat ladies, because I had missed their luncheon last year. Grace-Marie always adds one red ingredient to every recipe she makes in their honor, so I knew the dishes she was preparing would be fun and delicious. In addition to the fabulous Watermelon Gazpacho, we had Savory Garden Tomato Muffins, Red Pepper and Pesto Chicken Bites, Ruby Nectarine and Goat Cheese Croissant Tea Sandwiches, Red Cherry and Macadamia Nut Cookies, and Red Plum “Tarte Tartin” Cake. The entire lunch was fantastic, but it was this Gazpacho that was over the top. I mean, this is the BEST gazpacho I have tasted in my LIFE. It was sweet from the watermelon and so tasty from Hatch Chiles, fresh fennel bulb, lime juice and zest, tomato, and red onion. Flavored with cilantro and mint, along with the flavor notes of smoky Spanish paprika, cumin and ground coriander, it made my taste buds sing. A cappella. Really beautiful. It is Hatch Chile time and Bristol Farms was having a big event outside the store when I arrived. Huge cartons of Hatch Chiles were stacked up everywhere and little samples of roasted chile concoctions were being given out. The Hatch Chile is grown in New Mexico and is quite famous. The Hatch Chile Fest is expected to gather around 30,000 people over this Labor Day Weekend. 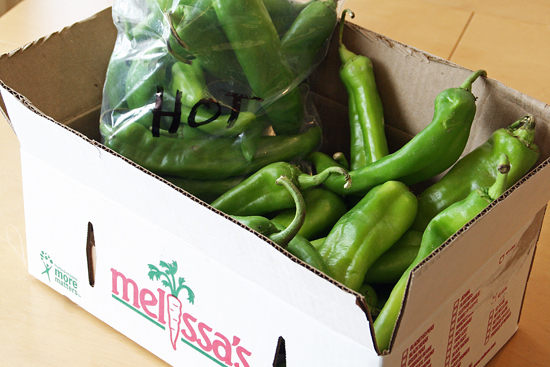 You can get Hatch chiles for yourself at participating Bristol Farms and Ralphs markets over the next week. 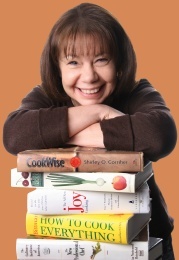 Dorothy, over at ShockinglyDelicious, will show you how to roast Hatch Chiles yourself and about the Hatch roasting events in Southern California. Check these out. Here you can see the ruby tones of the watermelon and the toasty delicious looking Hatch Chiles that were part of the garnish on top of the Gazpacho. The garnish was completed with cilantro, mint and lime, giving a little hint about the flavors in the jeweled topaz of the soup you are about to enjoy. 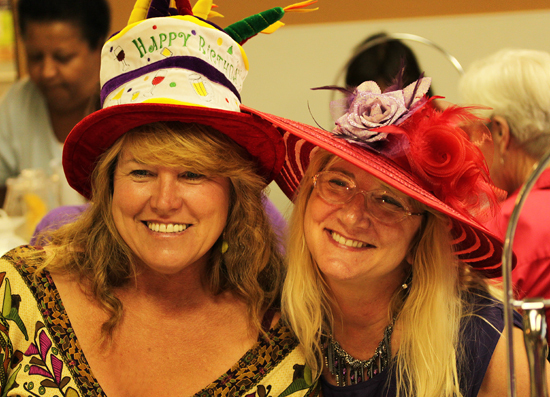 One of the Red Hatters had a birthday and was celebrated with the Birthday Hat and a song. I wanted to get a group photo to show off the great hats these gals were wearing. The Red Hat Society is the largest women’s social club in the world and is primarily for women 50 years and older. Their sole objective is to inspire, empower and transform the lives of women through fun and friendship, and they have chapters in 50 states and 30 countries. 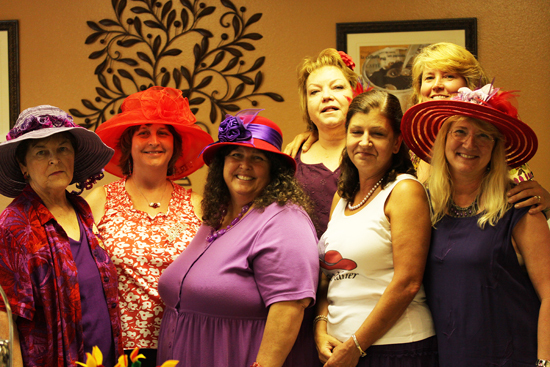 I hope you will check out the Red Hat Society website and see all the fun stuff that they do. You can also read about Queen Mum Jeanne Smith in this article from the Redondo Beach Patch about the Redondo Rubies Chapter. And please check out these fabulous red hats that are available. I may join just so I can wear one. 1. Using a food processor, in batches, puree all ingredients until thick like a smoothie. Cover and refrigerate for several hours to chill completely. Before serving season with salt, pepper and more lime if necessary. 1. Combine garnish ingredients in a bowl and toss to combine. Salt and pepper to taste. Cover and refrigerate until ready to use. 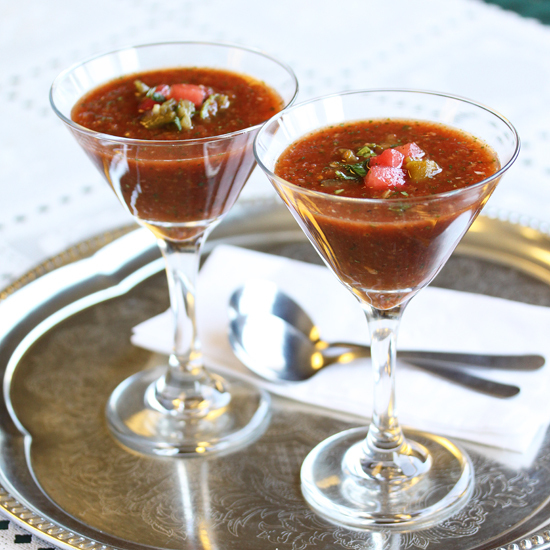 Serve the gazpacho very chilled in small bowls or cups (preferably chilled) and add a spoonful of garnish in the center. Note: If Hatch Chiles are not available, roasted anaheim or poblano chilies may be substituted. That looks like such fun and the recipe looks fabulous. 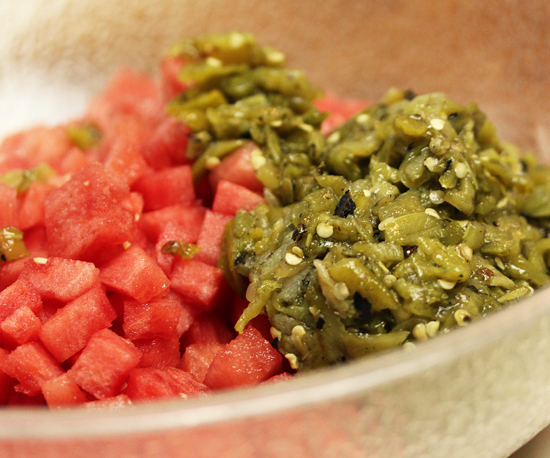 Roasted up my Hatch chiles this weekend, and this watermelon gazpacho is up next! 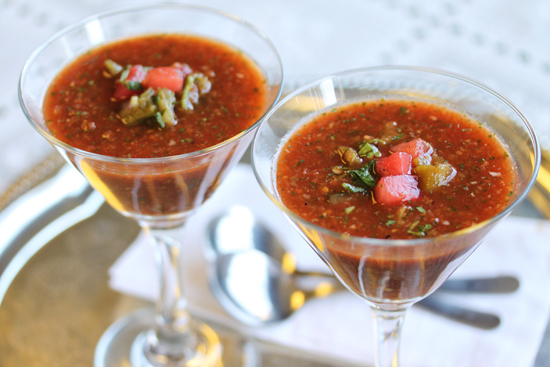 I do love the fresh flavors of gazpacho but always find myself wishing it was warm, haha.